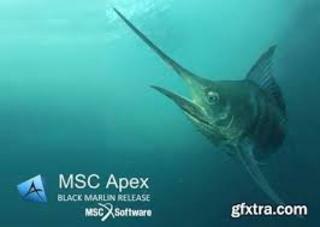 MSC Software Corporation, announced the Black Marlin Release of the company's next-generation complete Computer-Aided Engineering (CAE) platform, MSC Apex. MSC Apex is the world's first computational parts based CAE system that will serve as the platform for a broad range of physics and applications that MSC Software will introduce over time. MSC Apex transforms the way engineers perform simulation by reducing critical CAE modeling and process time from days to hours. The platform delivers innovative technology that enables predictive product development in the earlier stages of design where it is critical in saving time and money. With a paradigm shift away from traditional pre-solve-post point solutions, users can leverage the same user experience to carry out end-to-end simulation workflows with full associativity between geometric and analysis data, including fully generative behavior to ensure that all aspects of the model are consistent and up-to-date following design changes. CAD geometry is not suitable for analysis and geometry repair/improve and meshing operations are tedious, error prone, and take too long. MSC Apex features a complete set of direct modeling tools to make geometry clean-up and idealization steps fast and easy. These features provide dramatic productivity improvements for engineers. The traditional process for validating a Finite Element (FE) model is iterative and time consuming involving repeatedly submitting jobs and interpreting solver cryptic warning/error messages. The generative behavior of MSC Apex is fully leveraged to incrementally validate the evolving model and remove the many time consuming iterations inherent in the old pre-solve-post paradigm. MSC Apex is a Parts & Assemblies Model Representation centric solution allowing supply chains to share a unique product structure while independently managing instances of parts, sub-systems, full assemblies, and their corresponding multi-fidelity behavioral representations. This enables each person in the overall product development workflow to finally have the right data. MSC Apex offers a unique, fun and easy-to-use experience making it possible for non-CAE experts to learn the software in a single day. This new user interface approach allows for a 10x reduction in tools. Built-in video tutorials, workflow instructions and at-mouse guidance make it easy for engineers to quickly learn and become productive at simulation. With robust support for industry standard .bdf file import and export, MSC Apex makes for easy migration of data and smooths the integration of the product into existing tool chains such as those incorporating Patran and MSC Nastran.